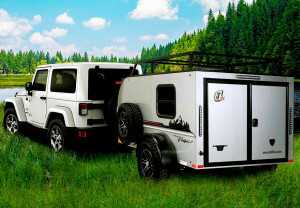 The Chase trailer by InTech RV is lightweight, compact, versatile, and ready to go off-road with you! 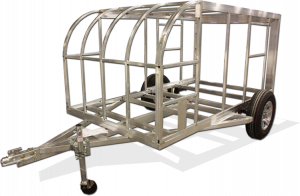 Like all InTech RV travel trailers, it starts with an all aluminum welded cage frame. The durability that comes with this type of construction is unmatched in the lightweight trailer world! Exterior panels are .040 aluminum as well, installed with a no screw, seamless panels that will be easy to clean, strong, and lets face it, they look great! The list of features include the “black out package”. That refers to the black trim and black vent covers used on the exterior to give it a more uniform look. The graphics are sporty, the taillights are LED strips, there is extra storage on the tongue, a 2” receiver on the back, and the roof rack, black diamond plate steps and rock guard make this a good looking piece of gear for your next adventure! The offroad tires, 2” lift kit and the roof rack are options available on this trailer. Both the standard and off-road tires are 15” with electric brakes. Overall, the outside of the 2019 Chase doesn’t look like your dad’s RV, it is ready to go absolutely anywhere you want to go. Did I mention it looks amazing behind a Jeep? Now that you know it looks great and is built tough, lets review the inside. The inside is a versatile space with a floor length of 89”. The twin mattresses are 78” long, so there is some floor space left at the end. The front of the trailer has a storage cabinet with a countertop that is about 15” deep. There is a stereo, some lighting, and a roof a/c with a heat strip for camping in all kinds of weather. The carpeted sides and ceiling not only make it feel comfy and cozy, but it also helps control moisture that can collect in a small space and protect the walls from any gear you are carrying. There is a large window in the side door, and sliding windows on each side of the trailer for ventilation. The double doors open up the entire rear wall of the trailer for loading or just enjoying the outdoor space! The 2019 Chase by InTech RV is tough, stylish and versatile. With the lift kit, off-road tires and roof rack, it still fits in your garage at 6’6” total height. 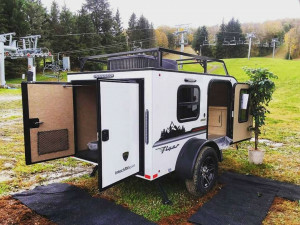 If your looking for a lightweight trailer to get you out of a tent and off the ground, you need to check out the Chase.